To receive updates on the center’s research, faculty and productions, subscribe to the newsletter. The Center for Aging Research pursues a wide variety of research topics that affect the aging population, including brain health, decision-making, physical fitness, transitional care, nursing home care, and medication use. A collaborative initiative between IU School of Medicine and Regenstrief Institute, the Center for Aging Research produces world-class interdisciplinary research that informs the scientific community, partners with providers, and betters the lives of patient and lay communities. The Center is funded through the National Institutes of Health, the Centers for Medicare and Medicaid Services, the Regenstrief Foundation, and other extramural funding agencies. The course of care for older adults often involves transitional care, moving from one health care setting and team of practitioners to another. Unfortunately, gaps in communication and access to needed services during these transitions can leave patients vulnerable to adverse events and greater chances of re-hospitalization. The goal of research in this area is to improve the outcomes for patients in transitional care, reduce avoidable hospitalizations, and improve the ease and efficiency with which patients and their caregivers move between care settings. Healthy aging is active aging, and the Center for Aging Research creates programs that help seniors stay active and fit into their golden years. Obesity and its related issues continue to be a rising concern locally and globally. Different groups experience varying access and barriers to achieving a healthy level of physical activity. With the help of community leader Eskenazi Health, the center’s programs reach seniors in their homes and at their doctors’ offices to study active options for aging. Work in this area examines ways to better integrate fitness into health care across all demographic groups. Changes are inevitable as people grow older. Brain health and safety are critical to healthy aging and quality of life, and while many older adults may experience some mild cognitive decline, others suffer from conditions such as Parkinson’s disease, Alzheimer’s disease, and other forms of dementia. There are few whose lives haven’t been touched in some way by these impairments. Center investigators are working in both clinical and research settings to better understand how to protect the brain and improve cognitive functioning in older adults–from the partnership with the Sandra Eskenazi Center for Brain Care Innovation to research studying the effects of medications on the aging brain, as well as interventions for patients with Alzheimer’s and delirium. Patients in long-term care facilities often need their families, caregivers and health care providers to guide and support end-of-life health decisions. Interventions from hospice and palliative care teams greatly improve the quality of life and care for patients and their caregivers toward the end of life. The center works with nursing homes in the Central Indiana area to create facilities that check with patients and their families every step of the way to make sure wishes are respected. The award-winning faculty at the Center for Aging Research have developed and validated several aging research and clinical tools. The Six-item Screener is a brief and reliable instrument for identifying subjects with cognitive impairment and its diagnostic properties are comparable to the full Mini Mental State Evaluation. This tool can be administered by telephone or face-to-face interview and is easily scored by a simple summation of errors. 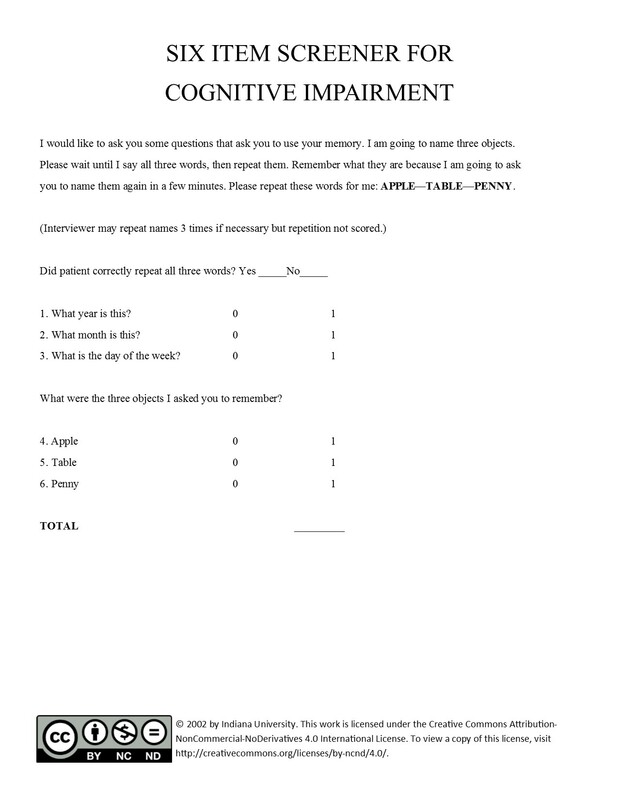 The Family In-Patient Communication Survey (FICS) allows the family of patients with cognitive impairment to rate their communication experience in the hospital. The survey provides health systems with quality and patient-family satisfaction measures.